(PRLEAP.COM) San Diego – October 30, 2014 – GreenRope, the Complete CRM and marketing automation platform, announced the launch of its mobile application on the iPhone App Store and Android Marketplace, making the GreenRope app accessible to all smartphone users. The new app gives the gift of easy, mobile CRM to all GreenRope users. Sales representatives can now spend less time at their desk and more time on the go selling and closing. The new iPhone and Android App enables users to access their contacts, add CRM activities, and manage their calendar, and more. This new and improved app should attract users looking for a mobile friendly CRM system. "Mobile users on any system should have access to the mobile app," says CEO, Lars Helgeson. 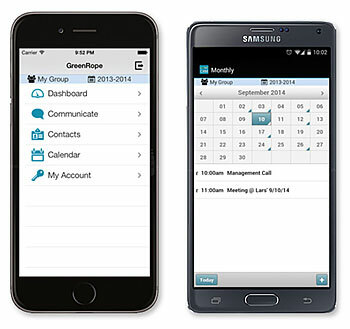 "We are really happy to bring the functionality of CRM on the go to all of our users." 1. Full access to the CRM: View all contacts, review past CRM activities, and add new CRM activities as they happen. Record notes and schedule future activities all from one screen. You can also email or click to call from any contact's record. 2. Email your contacts and track your broadcasts: Send trackable emails to your clients without leaving the GreenRope app. Users will also be able to see any sent broadcasts and which contacts opened them. 3. Full access to your calendar: Never miss a meeting or an event. Users can view CRM activities daily, weekly, and monthly. Easily add and edit events. Mobile CRM is a critical component to any well-designed CRM platform. Sales representatives should be able to access their CRM whether they are in the office or out in the field. This encourages CRM usage and makes it easy to manage and track all contacts and daily activities.